The international defence exhibition IDEB Bratislava is an important showcase of defence and security technologies in Central Europe with a strong international participation of exhibitors and professional visitors from Austria, Czech Republic, France, Greece, Hungary, Poland, Turkey or United Arab Emirates. It takes place at the Incheba exhibition center in Bratislava starting from wednesday 16th may. The 7th International Defence Exhibition IDEB takes place at the Incheba exhibition center in Bratislava starting from wednesday 16th may. The international defence exhibition IDEB Bratislava is an important showcase of defence and security technologies in Central Europe with a strong international participation of exhibitors and professional visitors from Austria, Czech Republic, France, Greece, Hungary, Poland, Turkey or United Arab Emirates. For foreign subjects trying to succeed within the V4 countries this event is a unique opportunity for presentation and gaining contacts with representatives of the resort of defence, armed forces and security units from Central Europe. 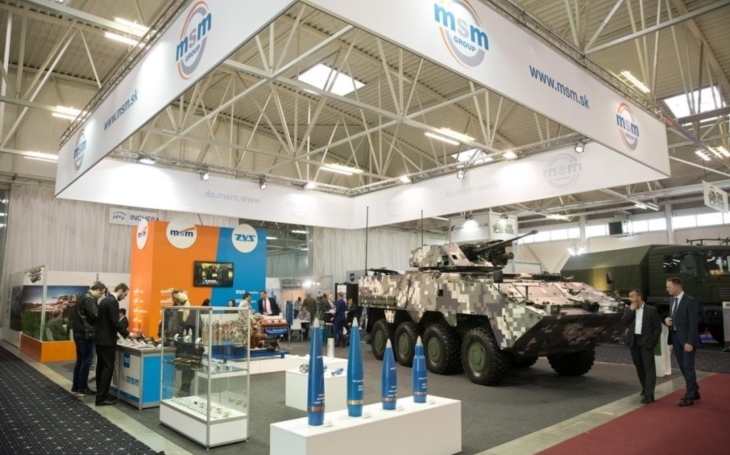 The Exhibition will present armoured vehicles produced by MSM Group, PSM, Patria, VOP CZ, Otokar, Renault, Kerametal, BAE, FNSS, SVOS, KMW, AMZ Kutno and Zetor Engineering Slovakia; new technologies concerning military kitchens, communication containers and the airship SILWA – SILENT WATCHER bringing smart solutions of silent air monitoring, long-term monitoring, surveillance and reconnaissance. The exhibits will also include the Saab JAS 39 Gripen aircraft model in real size with the possibility to try the pilot position (the Army of the Czech Republic operates 14 of these jet fighters since summer 2005). Besides the technology of the supersonic aircraft and ground transporters the exhibition will also present the equipment of the Armed Forces of Slovak Republic like bullets, anti-tank missiles, targets, parachutes, communication systems and technologies for aircraft, footwear, clothing and equipment for rescue forces, soldiers, firefighters, police officers; small arms, drones and security barriers for protection of civilian objects. Presented novelties are not only offered to the armed forces, but also to security forces for protection of civilians. The best exhibits registered for the competition will be evaluated by the professional jury and awarded with the Grand Prix IDEB 2018 title. For more details consult the IDEB’s official PRESS RELEASE. The Czech defence industry will be represented also by the VOP CZ, s. p., a company specialized in military equipment engineering production and development, military equipment repairs, modernization and machinery production. At it’s stand no. 105, hall D, the company will introduce the NIMR RIV Rapid Intervention Vehicle (VOP CZ is marketing partner for a wide range of NIMR vehicles in the region of Central Europe and especially for the Visegrad countries), the TAROS Robotic Vehicle, the MGC-01 Weapon Station and products of the critical infrastructure protection. The NIMR (RIV) is a light 4x4 rapid intervention vehicle to enable high-speed response to tactical situation in remote sites, able to be transported and inserted by ground transports and Chinook helicopters. Thanks to the 300 hp of it’s Fiat-Chrysler 3.0 V6 diesel engine found in the Maserati Ghibli the vehicle’s top speed reaches 160 km/h, and it can carry up to four fully armed soldiers, at 1,500 kg of payload and 4,000 kg of gross weight. The TAROS V2 is a 6×6 wheeled, unmanned, all-terrain, modular and automated robotic ground vehicle, designed to provide combat and logistic support in high-risk areas and complex environments, suitable for both military and civil security deployment. VOP CZ devloped the vehicle in collaboration with the Center for Advanced Field Robotics (CAFR), and Tactical Department of the Faculty of Military Leadership of the University of Defence in Brno, under the 21st century Soldier Programme for the army of the Czech Republic. The vehicle’s gun carriage can accommodate personal weapons such as a CZ 805 BREN automatic assault rifle, to support fighting activities of the mechanised, reconnaissance or special forces operating in tough and complex environments, preserving own personel. The vehicle can be used as a standard load-bearing platform, a forward operational platform to launch and recover micro-unmanned aerial vehicles (UAVs), a mobile communications command post and a land mine / IED detection system. The MGC-01 Weapon Station a remote controle weapon station for a .50 (12,7 mm) NSV machine gun, equiped with day/night camera Vision VB30S. The system is designed primarily for the T-55 and T-72 main battle tanks and their upgraded variants, yet it can be installed to infantry fighting vehicles, armored carriers and other vehicles. Within the products of the critical infrastructure protection VOP CZ will present it’s KERBEROS 3D VISION which is a globally unique system designed for inspection of chassis surface of vehicles, allowing for automatic detection of potential terrorist and sabotage attacks or spy equipment, and protection of vehicle access to guarded or otherwise important objects.